Is this just a cuddly toy? Well this one needs no help with identification – I’m sure we all agree on this one!! As Murphy’s law would have it, my cellphone had run out of batteries, and I was away from my computer for most of the day. 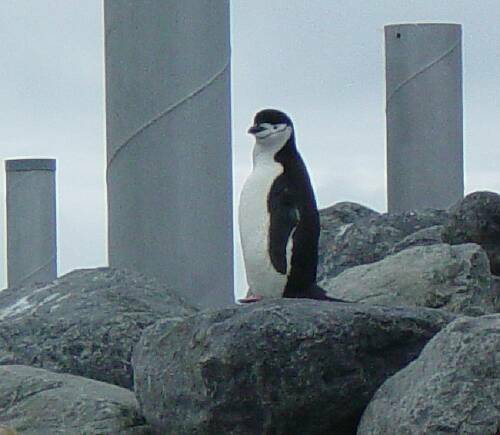 However, I finally received the message Sav had left on my cellphone……notifying me of this mega bird (2nd for mainland New Zealand), and the call went out to Tony Crocker, who posted it to BIRDING-NZ. 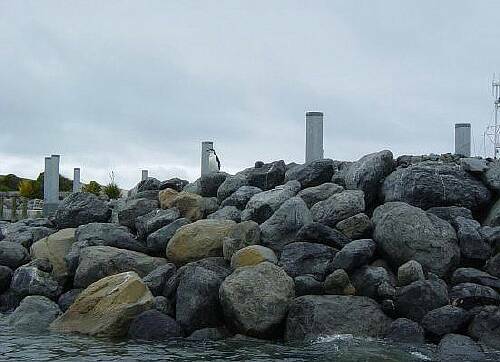 The following is Sav’s account of the finding…..
As the Oceanwings boat was approaching the dock this morning, a radio call alerted us to the presence of “a penguin, quite big, and maybe a Yellow-eyed” on the boulders that make up the edge of South Harbour. 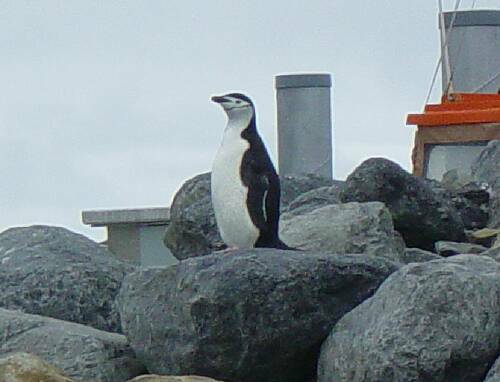 The boat skipper, Gary Melville, hurried along to have a look and we were quickly able to find the bird, sitting on the top of the boulder pile, in full view, and at about 15m range. 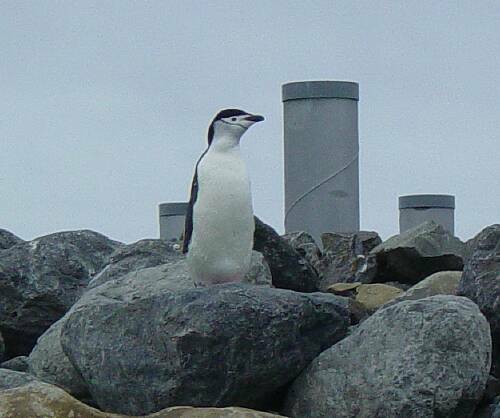 A little swearing followed the immediate realisation that the bird was in fact an adult CHINSTRAP PENGUIN. 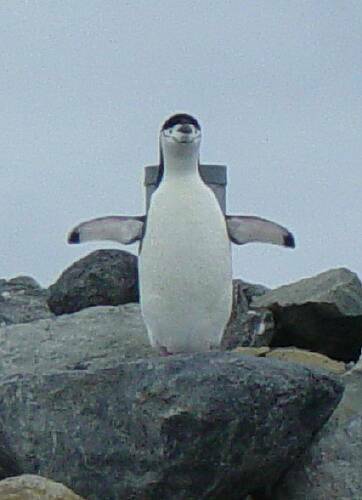 It was apparently quite well (not emaciated, not oiled, and not moulting). Unfortunately a couple of people then walked along the top of the boulder wall towards the bird which then hopped off into the water. I was unable to spend much time trying to relocate it (I hate it when work gets in the way of birding…) so I do not know if it reappeared or not. The bird was not seen again over the weekend, despite being searched for by Gary (Skipper of Oceanwings), and by the time Steve Wood and myself got down there on Monday (02/12) it had not been seen again, and despite searching the coast we came up with nothing. See my trip report for the day here. All photos on this page were taken by David Jackson. The photos are copyrighted and permission must be given to copy or use them in any form.